Today, we are all going to fall in love with a good book! Are you ready? But first I have a question. Have you ever had a book on your TBR pile for a while? A long while? And then when you read it you want to kick yourself for not reading it sooner? Not only was the story intriguing and really great, the writing was beautiful. The setting came to life, the word images grabbed me. The dialogue was superb. Honestly, I can’t say enough good things about this book. Here is a blurb from the book. Tending a void in her heart that demands to be filled, Abby Wells uproots her life in Ohio to move into the ancestral home in Georgia. Now that her mom is gone, it’s her best chance to connect with the last of her family, and she can’t deny the pull of the supposedly haunted house. The seductive comfort of believing that ghosts could be real drives her search, but Aunt Ruby’s plans for Abby don’t include revealing secrets kept for seventy years. Oh, there’s dirty laundry she’d like to air—just not her own. Indulging in the attentions of the house’s handsome caretaker helps numb her pain, but Abby’s ex-boyfriend won’t let go of the past. He hounds her about his newfound religion in hopes of reconciling, but why reach for him or the God who couldn’t or wouldn’t spare her mom? In the stillness of the old house, the spirit world feels so close she can almost touch it. But she doesn’t know yet that there’s more than one way to be haunted. Lindi: Where did you get the idea for the story? Brandy: The seed came from my family genealogy. My great grandmother, Orilla, gave up my grandfather for adoption in the 1920’s. She never had any other children, and Grampa’s parentage was kept secret until he was an adult. A line from one of my grandmother’s letters to him really stuck with me. “If anyone knows about not getting what they want, it’s me.” I wanted to write a story about that—finding faith when we don’t get what we want. Lindi: What prompted you to write about a ghost? Brandy: I like stories with a creepy factor, but I knew it’d be tricky to write a Christian ghost story. I prayed about it and Whisper in the Branches is the result of that prayer. Lindi: I was blown away by your writing. Tell me how writing came into your life. Brandy: I’ve always known that I was a writer. I remember in the 2nd grade I received kudos from a teacher regarding my writing, and I try to pay that forward. It’s so important to encourage kids when they’re doing something well. Another milestone came in the 9th grade when I took a creative writing class. Learning to give and take feedback at an early age was so valuable. During college writing went on the back burner, but when I was hitting 30, the parable of the talents got under my skin. Was I burying my talent in the ground? I started working on my first novel—you know, the one that ends up under the bed! Since then, the journey has been a process of growing in commitment to use the talent God gifted to me. Lindi: Do you have a goal for readers as you are writing? Brandy: I pray for my readers, that they’ll receive a blessing and that God will use what I write in people’s lives. He doesn’t waste anything. Everything we go through, even painful experiences, can funnel their way into stories. In fiction, I can find the good in them—the lump of coal that becomes a diamond. Lindi: Do your stories have a theme? Brandy: Yes! I love past to present connections. I like to examine how people deal with their personal histories, how we grow out of our hurts and move forward to victory, and how God molds and shapes us, especially when it comes to family. I asked Brandy what she was working on next and the title will hook all of us for sure. Like Honey for the Bones. In this romantic suspense, a century-old cold case brings Kyle and Solveig together, but their terrible secrets have the power to tear them apart. She’s working on it now, and it sounds great. Brandy does have a short story out, His Pepper Heart. I want to thank Brandy for taking the time to meet with me and chat about writing, reading and stories. Please welcome Brandy and ask her any questions you’d like. She’ll be hanging out today with us. And we are giving away a prize! 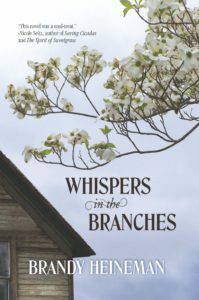 1 copy of Whispers in the Branches, E or print, winner’s choice. Just comment to be in the drawing. Hi Lindi! Sadly, I have many books on my TBR list. Between my bookshelves and Kindle, I’m set for life, yet I continue to purchase more wonderful books. Thanks for introducing us to Brandy. Her book sounds wonderful! I have book two of a series on my TBR list, it has been there for rather a long time, I loved book one, but just have not gotten around to book two:( Thanks for the introduction, I have not come across Brandy’s books before, so plan to check them out. Hi Wemble! I have #4 in a series languishing on the coffee table right now. I waited forever and a day for it to come out in paperback and have no idea why I haven’t read it yet… Funny how that goes sometimes! Wemble—I love reading series. :) I know you’ll love Brandy’s book. Yes, I was just staring at the stack beside my bed of books I’ve not yet read. It’s a great problem to have, though. I must not be too troubled by it because I downloaded three more to my Kindle, too. Ha! Thanks for this fun post. I interviewed Brandy for a debut author blog post a while back and didn’t get a chance to read the book yet. Thanks for the reminder and I’m happy to hear it’s a great read. Hey there, Heidi! Yes, that interview was special because it was my first author interview! :D As for “the stack,” I know it well. There are usually no less than 3 or 4 that I’ve promised myself are “next.” Haha! Colleen—I look at covers a lot when trying to decide. I do like Brandy’s cover, but I love people on covers, too. Whispers in the Branches sounds really interesting!! Melynda–it is very interesting. :) Twists and turns I didn’t expect. I know exactly the feeling of having a book on my TBR pile for a while and then reading it to figure out I should have read it sooner. I have way too many books in my TBR pile and I blame that, plus tons of work that won’t get done. Also I choose my next book mostly based on what I feel like reading at the moment… and in rare events I force myself to read something I think I’ll probably like and should have read already, that’s when I get to find some great ones. I do love learning about new authors and new books. Whispers in the Branches sounds really interesting. Thanks for the introduction. Hi Priscila! I know, I have done this very thing so many times, and I had to laugh when it happened to Lindi! Picking a book from the pile depends on whether I feel like a light, fun read or a deep, thoughtful book, and usually I don’t like to read similar types of books back-to-back. So it’s hard to decide sometimes! Priscilla–I totally understand the reading what you are in the mood for. concept. Have you ever been reading more than 1 book at a time because you have decided you want to read something different? I have a lot of books on my TBR and yet I still buy more! Sounds like a great, different read! Have a fabulous day! Hi Beth! I’m the same way–I bought two paperbacks just in the last week! :) Couldn’t resist! Beth—Thanks for dropping by today. :) I hope you had a fabulous day, too. I have several books on my to read list, and I too have wanted to kick myself for not getting to a couple of them sooner! 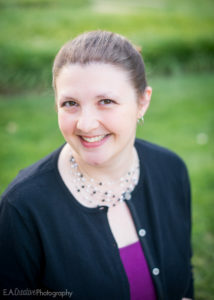 Ooh, I love finding a new author, and even though I have never heard of Brandi Heineman, I am really looking forward to reading her book “Whispers in the Branches.” I love books about families and genealogy, and throw in a ghost or two and I am definitely interested! Can’t wait to read this one!! Hi Lori! The last time I really felt like kicking myself was when I read a new author’s debut long after all the new-release buzz had ended. Suddenly I felt like telling everyone in the world about this amazing book, and it seemed like everyone had already heard! Hehe! Lori—Brandy’s book is def up your alley!! Thanks Linda for introducing Brandy to us. I’ve never read this book and it sounds very interesting! Thanks for joining us today, Brandy! Like you, I pray for my readers, and ask God as I’m writing what He wants to teach them — and me — through the story. My TBR is easier to ignore than some, as I only read on my Kindle or iPad and have done so for six years. In the early years I’d download nearly any free book that sounded remotely interesting, so I’ve been forcing myself in the last year to go to the last page on my Kindle every month or two, click on the oldest download, and make a decision whether I’m going to start reading it right now or delete it from the device. I’ve found a few books I resonated with that had been on my Kindle for several years! Now I am much pickier about what hits my Kindle, and I’m far more likely to actually buy books than at the beginning. And I agree–I’m pickier now than I used to be about my digital TBR list. Haven’t quite gotten to deleting books that I’ll probably never read, but I’m sure that day is coming. I was late to the party on eBooks, though, so I have nowhere near as many as some do! Val–that makes 3 of us that are pickier about our digital devices. I like your idea. I’ve had some books on my kindle for years. Margaret–I used to pack so many books on vacation because I read fast and the thought of having nothing to read causes me great anxiety! Thanks, Lindi and Brandy! That was a fun interview! And yes, I have tons of books, both print and on my Kindle that I’m so anxious to read but haven’t gotten to yet. This book sounds so intriguing. I love genealogy and learning more about my family’s past. I’ll have to put this book on my TBR list. It was fun “meeting” you, Brandy, and learning more about you. Oops, I don’t think I used the right link to reply to your comment, Winnie! Winnie–I know you’ll be a Brandy fan!! I think it’s interesting to note that your book is based loosely on a real life thought from your great grandmother. I’ve never thought about a Christian ghost. Sounds intriguing! Gail—The book has twists and turns regarding the ghost as well. Fun and intriguing! Hi Gail! Yes, Orilla was a special lady. She passed away when I was a toddler, but I look forward to meeting her someday in heaven! I am a recently retired special education teacher. I finally have time to really read what I want. I have books everywhere and I desperately need to buy some bookcases!! I don’t think I’ll ever finish all the books on my tbr list, especially since I’m always adding more! I enjoyed reading your post today!! Linda—Thank you. Brandy is such a great person—she’s fun!! And like you, I’m adding books to my pile a lot! Hi Linda! Yes, we could use a few more bookshelves, too. I’ve been trying to talk my husband into a full wall built-in for the dining room, but he just won’t budge… Hahaha! And how wonderful that must be, to have all the reading time you want. Sounds so fun! Please enter my name in the drawing. It sounds like a wonderful story. How many books do I have that are waiting to be read…….I’m not going to say how many!!!! Hi LeAnn! I count my unread books now and then–but I don’t think I want to admit the total… and I’m sure there are gems in there, too! I have quite a few books in my TBR pile that have been there awhile. I work at a school so have summers off (which means more time for reading). Last month I finally read Lisa Bergren’s 3 book Grand Tour series. Each book is about 400 pages and I wanted to read them when I had time to read them back to back with few interruptions. They were well worth the wait. Realistically, I will probably never be able to read all the books that I’d like to. We won’t even talk about all the books waiting on my KIndle. Pam—I’m glad you found the time to read something you really wanted to. That’s such a treat!! I have a stack on my dresser and one in the basement and books on my nook and Kindle app. We are busily getting ready for my daughter’s wedding Saturday, so haven’t had much reading time this week. Next week will slow down slightly. Hi Diana! Congrats & best wishes to your daughter on her wedding! I hope you have a wonderful day celebrating! I’m afraid I will never see the end of my TBR pile…lol! I’m not sure if that’s a good or bad thing really, it means I’ll always have something to read, but it means less space in my house taken up by bookshelves :-) That’s just my physical book pile not to mention my Kindle…haha! We won’t go there! Brandy, you’re a new to me author & I love discovering new writers…all you guys and gals are what have fed my voracious book appetite :-) Both of your books Lindi is featuring here sound good. Thanks for allowing her to interview you and for the giveaway chance! I, too, have had many a time when I’ve had a book on my shelf a long time before I was able to get to it, only to discover a gem!